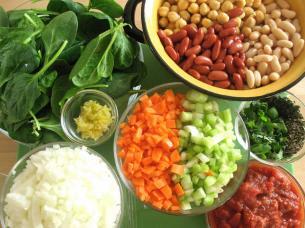 If you are just learning to cook, making a nice hearty pot of soup is a great way to develop confidence in the kitchen and end up with a fantastic dinner as well! Soups are very forgiving. If you don’t have the exact ingredient on hand, you can often make a substitution or two, and it doesn’t matter if your chopping is uneven. 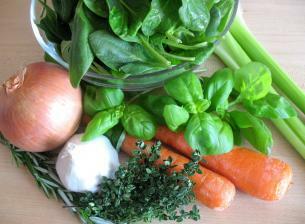 The fresh ingredients you will need for this recipe are onion, baby spinach, garlic, carrot, celery, fresh rosemary, thyme and basil. 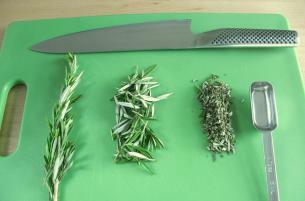 I would not advise using dried herbs with this recipe. 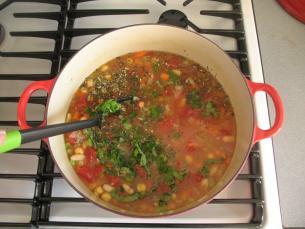 FRESH thyme, rosemary, and basil make a big difference in the taste of this soup. 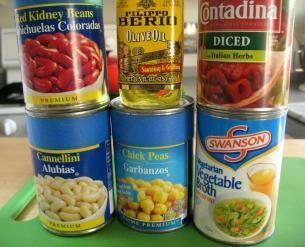 From your food cupboard (or the grocery store) you will need three kinds of beans, vegetable or chicken broth, olive oil, and canned diced tomatoes. Either plain or seasoned diced tomatoes will be fine. 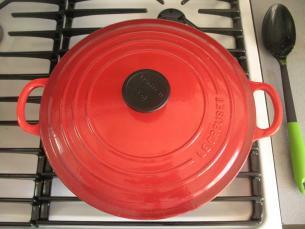 As always, get all your ingredients prepared and measured before you turn on the stove! 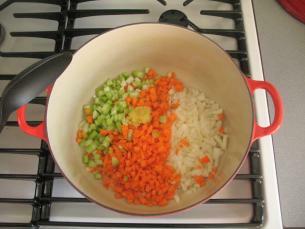 Carrots – Dice (or chop into small pieces) two carrots, which will yield about 1 cup. It is easier to dice a carrot if you cut the carrot so that it has a flat surface. 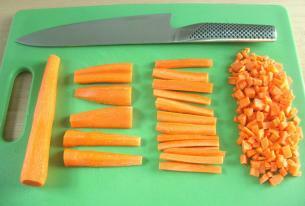 The picture below shows the stages (left to right) I use to turn a whole carrot into a diced carrot. Celery – Dice two stalks of celery. 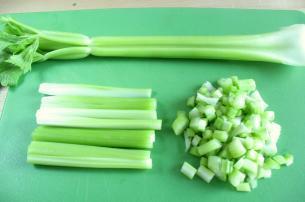 As with the carrot, first cutting the celery into strips will make dicing the celery easier. 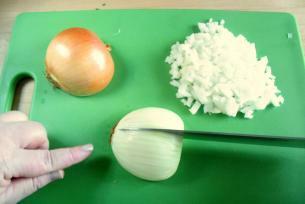 Onion – 1 large onion will yield approximately 1 and 1/2 to 2 cups of diced onions. For a quick review on how to dice and onion, click here. To make dicing easier, be sure to leave the root end intact. 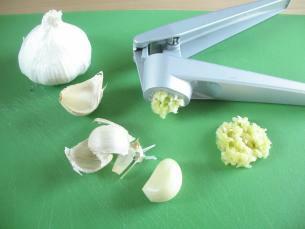 Garlic – To make two teaspoons of crushed garlic, you will need approximately 2-3 garlic cloves. Finally, the basil. 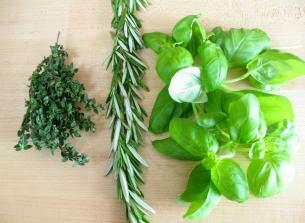 Jon, from the comment section, points out a quick tip for cutting the basil into ribbons. After you have washed the leaves put a pile one on top of another and then roll them up from tip to toe until you have a fat cigar of basil. It’s then easy to slice across the roll getting you nice slice. This is called a “chiffonade”. Again, just throw the stems away. 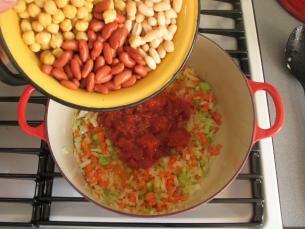 After you have rinsed and drained all the beans in a colander, all the ingredients will be prepared. 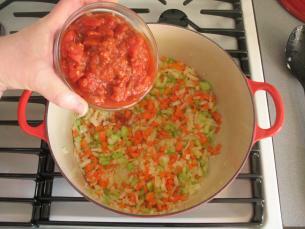 Add the onions, celery, carrots, and garlic and cook these vegetables for about 3-to-4 minutes. 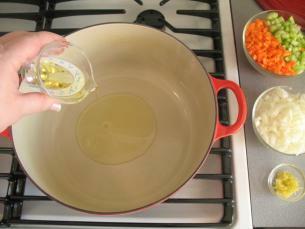 Bring everything to a boil, and then turn the heat down to simmer. 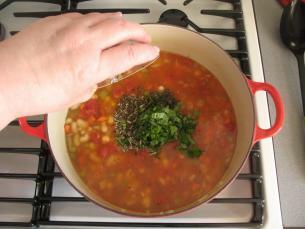 Cook the soup on “simmer” (a very low temperature) for about 10 minutes or until the vegetables are tender. 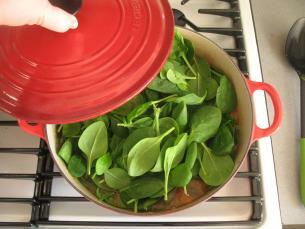 It will take about one minute for the baby spinach to wilt (go all limp). 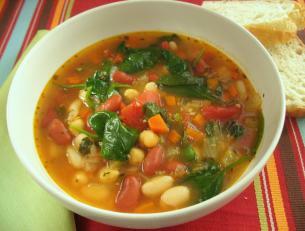 This Tuscan Bean Soup is ready to serve! The flavors in this soup really develop in time. 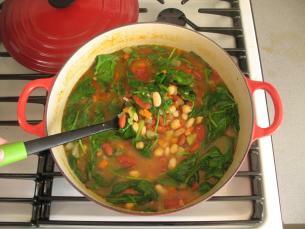 You can make this the day before serving it and it will taste even better by the next day! 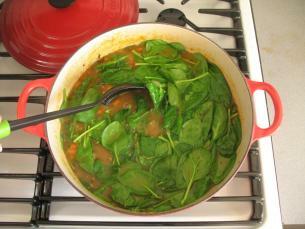 If you are going to be making the soup in advance, add the baby spinach just before you serve it so that it retains that nice bright green color. A quick word of thanks. The site is perfect for this now 50 year old who needs to conserve money and eat more often at home. Your collection of quick videos is just the right speed of instruction. 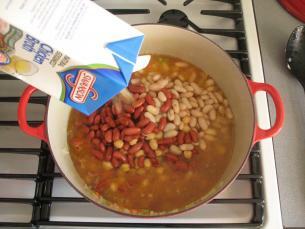 Plus, the Tuscan Bean Soup recipe looks delicious and is suitable for my diabetic friend. 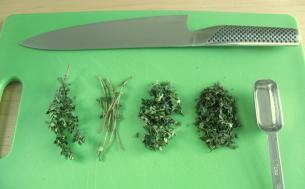 A quick tip for cutting the basil into ribbons. After you have washed the leaves put a pile one on top of another and then roll them up from tip to toe until you have a fat cigar of basil. It’s then easy to slice across the roll getting you nice slices. John E. I’m delighted you found us! Let me know if you have any questions. 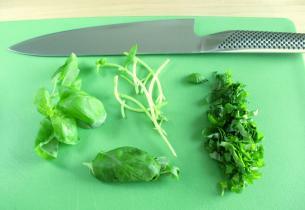 One more thing… as long a your knife is very sharp, the basil will not turn black after you have cut it into a chiffonade.